Your Washington, DC kids dentist believes a child’s first dental visit sets the stage for long-lasting, healthy smiles. Dr. Yelena Obholz and her staff have great dental skills and chairside attitudes to make young patients–and mom and dad– feel at ease. Front teeth, lateral incisors, molars, pre-molars–even though they are “just” baby teeth, they are vital to your child’s oral and even overall health. That’s why your Washington, DC children’s dentist, Dr. Yelena Obholz, wants to see kids by the age of 3 to ensure teeth (and gums) are intact, functioning and developing normally. 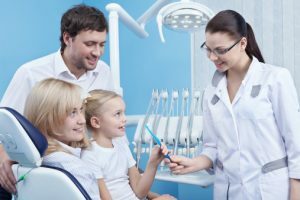 As parents bring their kids to Aesthetic & Family Dentistry of Washington, they can anticipate a kid-friendly atmosphere and should gently encourage kids to look forward to meeting their dentist. Parents are welcomed throughout their children’s routine visits and treatments, too. Toddlers may sit on mom’s or dad’s lap for initial check-ups. During the first visit, the Washington, DC kids’ dentist inspects teeth and gums for cavities and gum disease, both of which preventable or highly treatable with early intervention. The doctor notes the number and position of every tooth and which ones are erupting. The Washington, DC family dentist develops a care plan just right for your child’s age, oral health and development. It’s based on her diagnostic findings. Digital x-rays examine roots, bone structure and eruption of adult teeth. Toothprints thermoplastic wafers document a child’s unique bite and DNA at ages 3, 7 and 12 to give parents a tool to help law enforcement in the event of child abduction or accident. The doctor often this prophylactic treatment: plastic sealants. Applied as a varnish, plastic sealants cover the deeply grooved chewing surfaces of back molars which are so susceptible to decay. After preparation with an etching chemical, the sealant goes on smoothly and gets hardened with a curing light. The treatments last a good 10 years, enough to get your child through that cavity-prone time. It’s not scary but fun! The team at Aesthetic & Family Dentistry of Washington recommend 6-month exams and cleanings for all of their young patients beginning at 3 years or age. And of course, if parents have questions, or if there is a dental emergency in the meantime, Dr. Obholz wants a phone call right away. Contact the office today to arrange that first dental visit for your child.